On 15 June 2012, two tropical cyclones active in the Pacific basin! 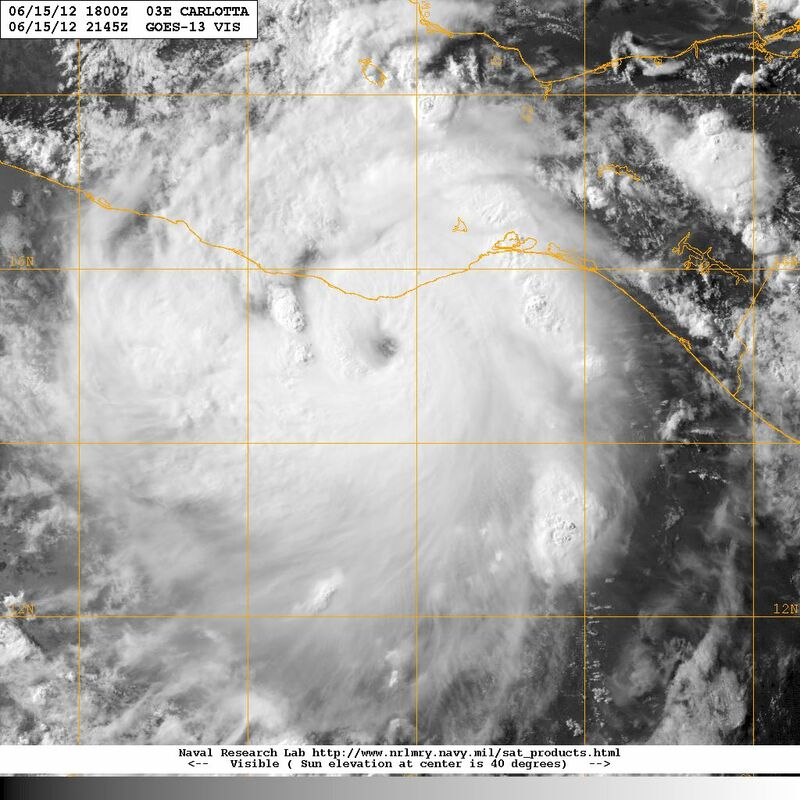 Barely one month into the Eastern North Pacific 2012 Hurricane Season and already the 3rd-named storm of the season, a category 2 tropical cyclone named CARLOTTA, is active just a few kilometers off the Pacific coast of Mexico near Pochutla. This hurricane is in a favorable ocean-atmospheric environment that may lead to further strengthening over the next 12 hours although as it continues to come closer to the coastline it will interact more and more with the mountain range that parallels the coast in that region, which may cause some disruption to the system. Consequently there is uncertainty as ti which scenario might prevail, further strengthening versus disruption through interaction with topography. What appears quite certain is a major impact along the coastline up to and beyond Acapulco with plenty of rain, storm surge and the potential for flash floods and significant flooding of the coastal region. There is uncertainty with respect to the track Hurricane CARLOTTA may follow after 24-36 hours due to atmospheric features to its north and east, which may actually steer it toward the west. Some models however are forecasting the storm might even make a ‘hairpin’ turn and head back toward the southeast. It appears only time will confirm which scenario eventually happens, but should the ‘hairpin’ forecast come to pass the impact along the coastal region for hundreds of miles might be a lot worse, in terms of flooding and damage. It is clear, all interest along the Pacific coast of Mexico from Puerto Vallarta down to communities along the littoral of the Isthmus of Tehuantepec must keep their emergency plans activated, while monitoring the progress of this storm closely over the next 3 – 4 days in order to present and effective response to what could turn into a major impact. Concurrently with these developments, but 15,000 kilometers to the west, in the northwestern Pacific a major category 3 Typhoon GUCHOL is tracking North by Northwest some 450 kilometers to the east of the central Philippines Islands aiming in the general direction of Taiwan and Southeastern Japan. The storm is tracking through an environment that may favor further strengthening in the next 24 – 36 hours, with some data suggesting the typhoon may reach category 4 strength with maximum sustained winds in the range of 220-240 kph over the open waters of the Philippines Sea to the east of Taiwan. The southeastern region of Japan, particularly the islands of Kyushu and Shikoku and the Wakayama peninsula, and even the Tokyo-Yokohama area appear most at risk based on current projections, but there is a high degree of uncertainty that far out in time from the storm’s current position. While interest in Florida monitor potential developments in the far fringes of the Atlantic basin, the peninsula has suffered the impact of extreme rain events and severe thunderstorms with some regularity over the past several days, as a result of storms systems moving in from the southeastern USA and clashing with moist and warm air from the Gulf. As we observe these tropical activity, we must keep in mind there are several months ahead of potential tropical cyclone activity in 2012. Consequently we must be prepared, pay attention, and above all MITIGATE!! Previous PostThe Eastern North Pacific: It is boiling out there!Next PostWhat’s cooking out there?